The Raritan Valley Rail Coalition (RVRC), a rail-advocacy group representing 1.7 million residents in four counties along NJ Transit’s Raritan Valley Rail line, will sponsor a free presentation on the Gateway Project, beginning at 7:00 p.m, Tuesday, March 26th at the Cranford Community Center. All are welcome to attend the free event. The Cranford Community Center is located at 220 Walnut Avenue in Cranford, with onsite parking. Jerry Zaro, an attorney with Sills, Cummis and Gross P.C. in Newark, serves as Chairman of the Gateway Development Corporation (GDC) and will be the featured speaker. The GDC oversees the Gateway Project, the multibillion-dollar infrastructure initiative to build new rail tunnels under the Hudson River, rehabilitate the already-existing 108-year-old tunnels (which were badly damaged by Superstorm Sandy), build a new Portal Bridge over the Hackensack River, expand New York’s Penn Station, and related projects. It would be the largest current infrastructure project in the United States. Peter Palmer, former Somerset County Freeholder and current RVRC Trustee, said that commuters continue to suffer from delays and cancelations from an over-burdened and antiquated train system in dire need of upgrades. Somerset County has five train stations along the Raritan Valley Rail line. “Our residents who rely on train service are being pushed to their limits,” said Palmer. “Further delay in making desperately-needed improvements to train service will damage regional economic development. The Rahway Rail Coalition will continue to advocate as strongly as possible on their behalf. Bette Jane Kowalski, Chair of the Union County Board of Chosen Freeholders and an RVRC Trustee, is promoting Union County’s efforts on the Raritan Valley Rail Coalition this year as part of the Board’s 2019 initiatives. Union County has eight stations on the Raritan Valley line, including one in Cranford, where Freeholder Kowalski resides. Hunterdon County Freeholder J. Matthew Holt, a RVRC Trustee, stated: “Both the Gateway Project and restoration of the one-seat ride on the Raritan Valley rail are crucial to the economic vitality of our region. 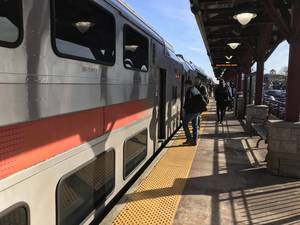 Making these improvements would not only make the commute better, but bring economic benefits to the region---including increased home values, and increased commerce.” There are four train stations along the Raritan Valley rail line in Hunterdon County. The Northeast Corridor carries more than 800,000 passengers in 2,000 trains daily across eight states and Washington D.C. A 2016 Amtrak report found that implementation of the full Gateway project could generate $3.87-worth of economic benefits for every $1 spent. The Coalition, which also consists of a Mayors’ Alliance and of County and State officials, can be reached on email at info@Raritanvalleyrail.com, is on the web at raritanvalleyrail.com/, on Facebook at facebook.com/raritanvalleyrail/, and Twitter at twitter.com/rvrailcoalition.